Biography: Prof. Ahmed Yousef has completed his PhD in 1999 from Mansoura University and postdoctoral studies from Western Michigan University, USA. He is Ex-Chairman of Studies and Projects Sector at the Egyptian Ministry of Agriculture and is now the Professor of Water Resources in DRC, Egypt. 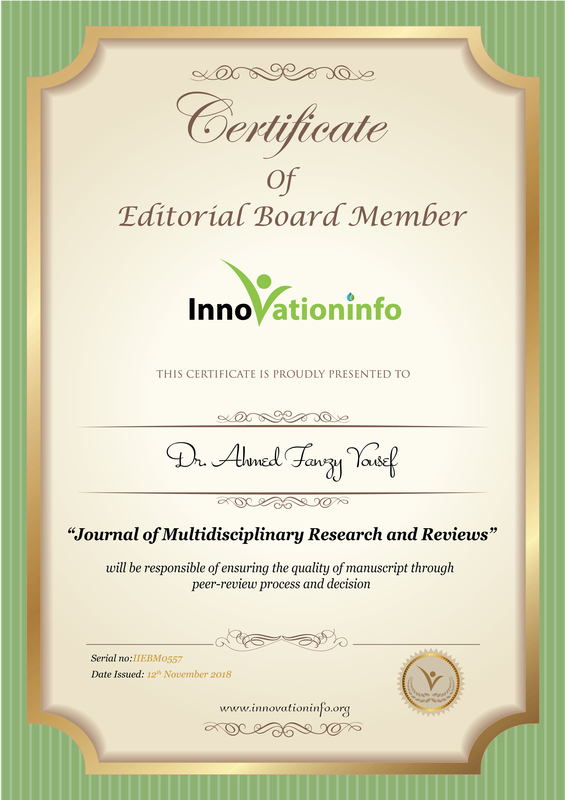 He is Editor, Academic Editor and Associate Editor as well as reviwer in Some International Journals. He has gained wide experience for more than 25 years in various management related, water resources policy, hydrology, hydrogeology, sedimentation, environmental planning, ICZM, disaster risk management of climate change, desertification and agriculture plans, transboundary strategic action programmes, economics and social issues, and documents. He has been working as a consultant and team leader for a number of development projects sponsored by the World Bank, WFP, EC, FOA, ADB, Nile Basin Initiative and United Nation related water resources policy, hydrogeology, dams, protected areas, climate change and agriculture plans. He has published more than 60 scientific papers. 1. El Sabri, M. A. Sh., Ezzeldin, H. A., Yousef, A. F. and Salem, W. M. (2016): Groundwater origin and management in Moghra Oasis and its vicinities, Qattara depression, Western Desert. Egypt. Geological Society of Egypt, Vol. 60, p. 60-75. 2. Mahmoud M. Khalil, Tomochika Tokunaga and Ahmed F. Yousef (2015): Insights from stable isotopes and hydrochemistry to the Quaternary groundwater system, south of the Ismailia canal, Egypt. Journal of Hydrology, Volume 527, Pages 555–564. 3. Yousef, A. F. (2013): Lights on the Hydrogeology of Moghra Oasis, North Western Desert, Egypt. Annals Geol. Surv. Egypt, V. XXXII, p. 1-24. 4. Yousef, A. F. (2013): Geologic Factors Controlling the Presence of Some Natural Lakes South Qattara Depression, North Western Desert, Egypt. Geological Society of Egypt, Vol. 57, p. 85-102. 5. Yousef, A. F. (2013): Hydogeological setting, hazard and mitigation of reclaimed area in Wadi El-Sayda north Aswan, Egypt. European Water: Vol. 42. 6. Yousef, A. F. and Shehata, S. (2008): Impact of hydrological constrains on natural vegetation cover in a representative watershed south of the Mediterranean Sea: An integrated approach. 9th International Dryland Development Conference (IDDC), p. 385 – 400. 7. Aglan, O. Sh. ; Yousef, A. F.; Salem, A. A. and Baraka, A. M. (2011): Geology of water resources in the Egyptian sector of Wadi Di-ib Basin, south Eastern Desert, Egypt. Annals Geol. Surv. Egypt, Vol. XXXI, pp. 23 - 39. 8. Sultan, M.; Yousef, A. F.; Metwally, S.; Becker, R.; Milewski, A.; Sauck, W; Sturchio, N. C.; Mohamed, A.M.M. ; Wagdy, A.; El Alfy, Z.; Soliman, F.; Rashed, M.; Becker, D.; Z. Sagintayev, Z., Ahmed, M. and B. Welton (2011): Red Sea rifting controls on aquifer distribution: Constraints from geochemical, geophysical, and remote sensing data. Geological Society of America Bulletin, v. 123, p. 911-924. 9. Aglan, O. Sh. ; Yousef, A. F.; Salem, A. A. and Baraka, A. M. (2011): Geology of water resources in the Egyptian sector of Wadi Di-ib Basin, south Eastern Desert, Egypt. Annals Geol. Surv. Egypt, Vol. XXXI, pp. 23 - 39. 10. Yousef, A. F., Khalil, M. M. and El Bady, M. S. (2011): Change detection of the geomorphologic features in north Nile delta, Egypt. Annals Geol. Surv. Egypt, Vol. XXXI, pp. 577 - 590. 11. Yousef, A. F. (2009): Comprehensive hydrogeological, hydrogeochemical and isotope behavior of Northeast Africa intracratonic basins: Case study Abu Simbil basin. European Water Resources Association 7th International Conference: 163-179. 12. Yousef, A. F.; Salem, A. A.; Baraka, A. M. and Aglan, O. Sh. (2009): The impact of geological settings on the groundwater occurrences in some wadis in Shalatein -Abu Ramad, South Eastern Desert, Egypt. European Water: 25/26: 53-68. 13. Yousef, A. F. (2008): The impact of northwest active fault system on the recharge of the Quaternary aquifer system around the Nile Valley: case study Wadi El Assuity, Eastern Desert, Egypt. European Water 21/22: 41-55. 14. Yousef, A. F. (2008): Impact of human activities on groundwater depletion and quality deterioration in the northwestern shelf of Nubian sandstone and fractured carbonate aquifer systems. 9th International Dry land Development Conference (IDDC), p. 411 – 428. 15. Yousef, A. F. and Salem, M. (2007): The impact of hydraulic engineering constructions of the groundwater occurrences in the Mediterranean Coast. J. Desert Res., 25 (2): 25-45. 16. Yousef, A. F. (2007): Assessment of water resources in Ayun Mousa area, Southwest Sinai, Egypt. J. Desert Res., 25 (2): 1-24. 17. Ghobashy, S. Y.; El Ghazawi, M. M., Hassanein, A. M and Yousef, A. F. (2006): Hydrogeological and hydrochemical evaluation of El Gora area, Northeast Sinai, Egypt. Third Arab Regional Water Conference: 1-18. 18. Yousef, A. F. (2004): New concept of the hydrogeoloical and hydrochemical setting of El Qaa Plain, Southwest Sinai, Egypt, AMSE Journal, France, Vol. 65 no. 5: 19-41. 19. Yousef, A. F. (2003): Geomorphological and sedimentological characteristics of El Qaa Plain using satellite images for future land use planning, Southwest Sinai, Egypt, AMSE Jour., France, Vol. 64 no. 6: 43-59. 20. Yousef, A. F. and Nor El Dein, M. (2002): Desertification in Egypt. 21. Yousef, A. F. and Abdel Kareem, M. H. (2002): New lights of geological and hydrogeological setting south Ismaelia Canal, East Nile Delta, Egypt, Third International Conference of Groundwater Level Control Inside Urbanized Areas, Faculty of Engin., Mansoura Univ. : 85-100. 22. Yousef, A. F. (2001): Some mineralogical studies and its significant in the recent evolution of North Sinai, Egypt, The 6th Conference Geology of Sinai for Development, Suez Canal Univ. : 199-209. 23. Yousef, A. F. (2001): Trace elements as related to geomorphological units in North Sinai, Egypt. AMSE Jour., France, Vol. 62: No. 3: 41-55. 24. Yousef, A. F. and El Shenawy, I. A. (2000): Environmental monitoring of North Sinai with emphasis on factors affecting the Salinity of some Sinai sediments, Sinai, Egypt, The First International Conference for Environmental Hazard Mitigation, Cairo, pp. 91-101. 25. Yousef, A. F. (2000): Geomorphologic and sedimentologic applications of remote Sensing for land use identification in North Sinai. The First International Conference for Environmental Hazard Mitigation, Cairo University: 102-115. 26. Yousef, A. F. (1998): Geology, pedology and hydrogeology of the Quaternary deposits in Sahl El Tineh and its vicinities for future development of Northwest Sinai, Egypt. Ph. D. Thesis, Mansoura University. 27. El Mowelhi, N. and Yousef, A. F. (1997): Geomorphology of Tina Plain and Surrounding North Sinai. 28. Yousef, A. F. (1994): Subsurface and geothermal prospecting in the Nile Delta, M. Sc. Thesis, Mansoura Univ.